The Tamar Invasives Project was created specifically to control invasive plants in the Tamar river corridor. The partnership of four organisations, Tamar Valley AONB, Environment Agency, Natural England and Cornwall Council, uses contractors to survey the locations of the plants and then treat the worst infestations. All giant hogweed sites and knotweed sites that are likely to have the most impact are treated. The main focus of the control work is on Giant hogweed; as our work in the AONB is vital to stop it spreading into Cornwall where it is virtually absent. Japanese knotweed has been treated, but only where funds allow. This year’s funds are short, so we have concentrated our efforts on hogweed treatment. The Tamar Invasive Project is a partnership of 4 organisations committed to controlling Invasive plants in the Tamar Valley – Tamar Valley AONB, Environment Agency, Natural England and Cornwall Council. 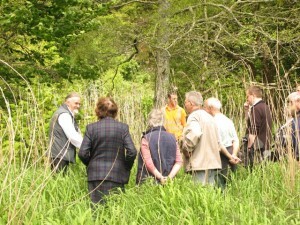 We have previously offered landowners within the project area a free visit, to assess invasive plants on their land and check the success of control methods. Each landowner received a free pack, including an aerial photograph showing the last recorded invasive plant locations plus other valuable information, including details of how to control the plants safely. Advisers were brought in from FWAG (Farming and Wildlife Advisory Group) South West, an independent wildlife charity with extensive experience of working with Natural England’s agri-environment schemes. From these visits it has been great seeing the pride people take in their bit of the river. We have also been able to witness the massive impact of flooding over the last year on our riverbanks.